Southern Tier New Horizons is a facility that solely focuses on the treatment of addictions, along with the co-occurring behavioral issues and mental health disorders that patients suffer from when they first come to the facility for treatment. The facility is part of the United Health Services and also forms part of the Binghamton General Hospital. Different types of programs have been developed by the licensed staff members employed at Southern Tier New Horizons to ensure patients can be helped regardless of how severe their addictions may be. One thing that patients should note about this facility is that they will not be provided access to a resort or a “house” while they are being treated, as the entire facility is designed with a clinical setting in mind. With this in mind, patients will know that they are in a hospital during treatment. Accommodation is provided to patients undergoing residential treatment at Southern Tier New Horizons in a hospital-like facility. There are two patients appointed to each of the rooms in the facility. A single common room is available, where group meetings are held. Patients also have their meals in the commons area. 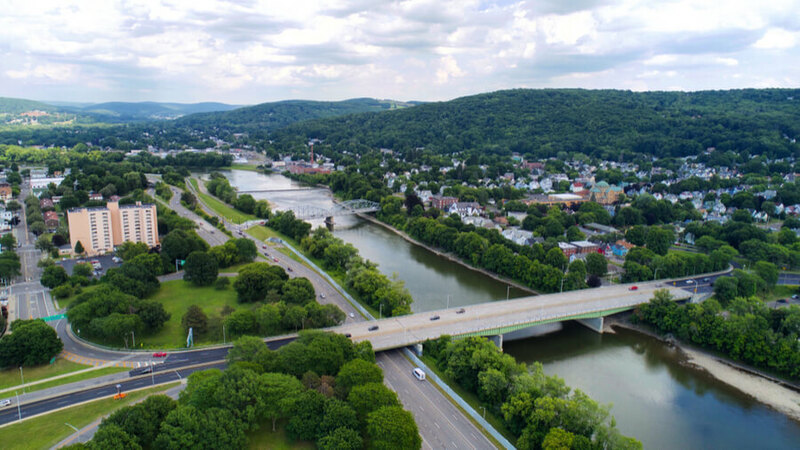 Southern Tier New Horizons is able to assist patients with their addictions and any co-occurring disorders through a range of treatment options that have been developed by the professional staff members who are involved in the addiction treatment system. While no detox services are available at the facility directly, patients may undergo detox at the main hospital and will then be transferred to Southern Tier New Horizons after they have undergone appropriate detoxification. Patients will need to attend both individual sessions with a therapist and group counseling sessions with a licensed counselor for several hours on a daily basis. The family programs that are offered at Southern Tier New Horizons offers patients access to additional therapeutic solutions that can assist in restoring bonds that have been broken within their family. Southern Tier New Horizons does accept the majority of insurance programs that patients might be insured through – this includes federally-funded programs. The patient first needs to ensure that they get the benefits of their insurance policy verified. This can be done by providing the appropriate staff members at Southern Tier New Horizons with their insurance details – once verified, the patient will be able to undergo treatment with no payment from their side, or, in some cases, with a small co-payment. Patients who do not have access to an insurance policy will need to understand that they are responsible for the payment of the services that Southern Tier New Horizons will offer them. Should the patient be unable to afford an upfront payment, they will need to consult with a financial counselor to set up appropriate arrangements for their bill. The United Health Service network of facilities and treatment centers have been officially accredited for the healthcare programs that they offer patients by the Joint Commission. There are no details of additional accreditations that the Southern Tier New Horizons facility holds in particular. Since the facility is part of the United Health Services program, there is little doubt that the facility has been appropriately licensed by state-based departments in order to ensure they can offer patients access to quality services that will promote sobriety. There are no exceptional amenities that are worth mentioning in terms of the facility that patients are provided with accommodation at while they are treated in a residential program at Southern Tier New Horizons. The only particular amenities that we noted is the fact that the facility does have supported for patients who require communication through American Sign Language. Those individuals who have impaired hearing abilities are also welcomed at the facility to undergo treatment for their mental health concerns and addictions. While the New Horizons division of the Southern Tier recovery organization does offer useful information on the page that represents this particular program, we did find that it can be difficult for patients to determine who the therapists and other staff members are that will be taking care of them if they decide that they would like to be treated at this particular facility. The page is part of the official United Health Services website and does not provide a specific list of staff members who are involved at the Southern Tier New Horizons facility. Instead, patients are given the ability to search for specific providers – which means the patient will first need to know the name of a particular medical service provider who would be offering them treatment services before they are able to gain more details of the specific physician or psychiatrist. Patients who would like to know the names of the service providers who are part of the treatment programs at Southern Tier New Horizons should give their office a call for more details. The administrative staff will be able to provide the patient with names that they might be able to search for on the UHS website.